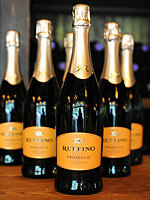 Beat summer heat with a crisp glass of bubbly! This clean sparkling wine bursts with orchard fruit essences, and boasts a few heart-healthy pros. Tasting notes: Extra dry with deep apple, pear, and peach hints—that's wine-speak for not too sweet (lots of bubbles keep it refreshing), but still full of fruit flavor. Drink wise: Bubbly is a heart helper! One flute of sparkling wine a week has been shown to lower blood pressure, thanks to the drink’s polyphenols, according to a study from the University of Reading in England. Plus, this pick’s 11% alcohol content is lower than most wines. Pair with: Prosecco’s clean taste pairs perfectly with white meats, shellfish, and fish. Try with smoked salmon for a light brunch cocktail. Surprise companion: Pizza! The fizzy wine cuts the acidity of the cheese and tomatoes.